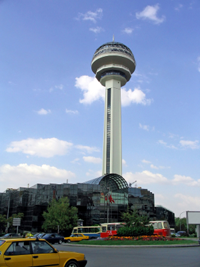 The history of Ankara and its surroundings stretches back to the Hatti civilization of the Bronze Age. The name Ankara comes from the word 'Ancyra', which means 'anchor.' The historical parts of the city surround the Castle. The Alaaddin Mosque found inside its walls is still one of the best examples of Selcuk art and wood craftsmanship, in spite of the fact that it was restored by the Ottomans. The area has experienced a rejuvenation with the restoration of many interesting old Turkish houses, and the opening a several art galleries and fine restaurants which feature examples of traditional Turkish cuisine, night life and more. Near the gate of the castle is the Museum of Anatolian Civilizations, which is a beautifully restored portion of the old bazaar. It contains priceless artifacts belonging to the Paleolithic and Neolithic eras as well as the Hatti, Hittite, Phrygian, Urartu and Roman civilizations.